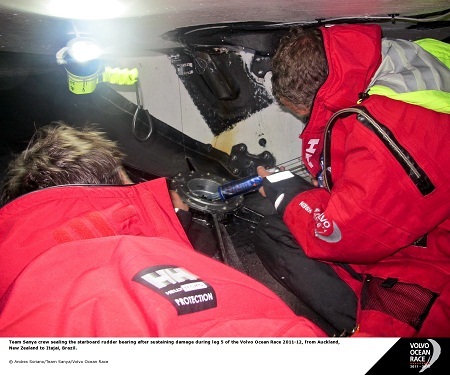 Record-breaking conditions and “the best sailing in the world” await the majority of the Volvo Ocean Race boats but Team Sanya have been left assessing their repair options after breaking a rudder while leading the fleet. Groupama sailing team and CAMPER with Emirates Team New Zealand have been slugging it out for the Leg 5 lead since shortly after 0800 UTC on Thursday when Sanya’s starboard rudder broke and about three tonnes of water gushed into the aft watertight compartment. Sanya skipper Mike Sanderson and his devastated crew immediately began repairing the hole, while the four teams at the front of the pack sailed away. The leading crews have since been busy stowing away valuables, ensuring essentials are within reach and checking their survival suits as they gain ground on the back of a low-pressure slingshot. Volvo meteorologist Gonzalo Infante said the Southern Ocean low would pack winds in excess of 40 knots and propel the fleet into potential 24-hour distance record breaking territory. “The low has very strong, very violent, very cold winds from the deep south, so strong that they are likely to reach gale force,’’ Infante said. “The boats will be going very fast, and depending on the sea state, we could see the 24-hour record smashed over the coming days." At 1315 UTC Groupama were clinging to first place with a 3.9 nautical mile lead over CAMPER as the fleet sailed with more than 20 knots boat speed. CAMPER co-skipper Stu Bannatyne, competing in his sixth Volvo, said this was the kind of racing he had been waiting for. Groupama skipper Franck Cammas said the wind had already been gusting in excess of 30 knots for the past six hours, and his team were preparing for more. “We have reduced the sail area and are getting ready for a tough period of time with a big low to round in the next four days,’’ he said. “We thought about these conditions when we built the boat and when we trained, but it looks like we will have more than expected and there is some stress on board while we wait. PUMA Ocean Racing powered by BERG navigator Tom Addis said the coming days would be more about survival than anything else. “At the moment we’re trying to go as fast as we can, but we’re not fussed about the positions, we’re just trying not to break anything,’’ he said. Team Telefónica are in fourth place, followed by Team Sanya in fifth, while Abu Dhabi Ocean Racing continue to chase the fleet in sixth position. Ian Walker conceded that the leaders reaching the low was bad news for his team, who were hopeful the fleet would be holed up for longer while they played catch-up after being forced back to port with damage just hours after the start. Meanwhile, Team Sanya are now focusing on repairs rather than racing, skipper Mike Sanderson said. The winning skipper from 2005-06 described hearing a loud bang while he was at the navigation station. Sanderson said his team had since secured the emergency steering system and fixed a hole in the aft watertight compartment. “It is the second time we’ve heard water coming into this boat at that sort of pace, so it’s pretty scary,’’ he said, referring to Leg 1 when the team tore a hole in their bow which threatened to sink the boat. More than 5,500 nautical miles remains between the teams and the finish at Itajaí, Brazil where they are expected to finish in early April.